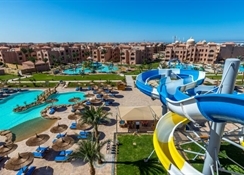 The Albatros Aqua Park Resort is a beautiful resort located just five minutes from the beach, in Hurghada. This resort has a private beach area and four swimming pools with water slides, as well as a large terrace to relax and sunbathe. It also offers a variety of leisure activities such as tennis courts, volleyball and multipurpose courts, a fully equipped gym with cardio and cardio machines, mini golf, table tennis, kids club and a spa with massages, steam baths and Jacuzzi. 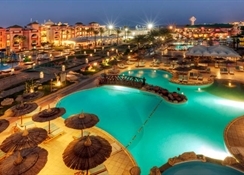 After sundown, the resort plays host to several live Egyptian and international shows. The resort has a business centre, a hairdresser and several shops onsite. It also has luggage storage, car and bicycle rental service and laundry, dry cleaning and ironing services. The reception is open 24 hours a day and offers tourist information. There is Wi-Fi in the common areas and different bars and restaurants, where you can have an aperitif, a refreshing drink or a dish of regional and international cuisine. The rooms of the hotel can be of standard or family type (with bedroom and living room) and are equipped with state-of-the-art amenities. They also have a balcony with exterior views. 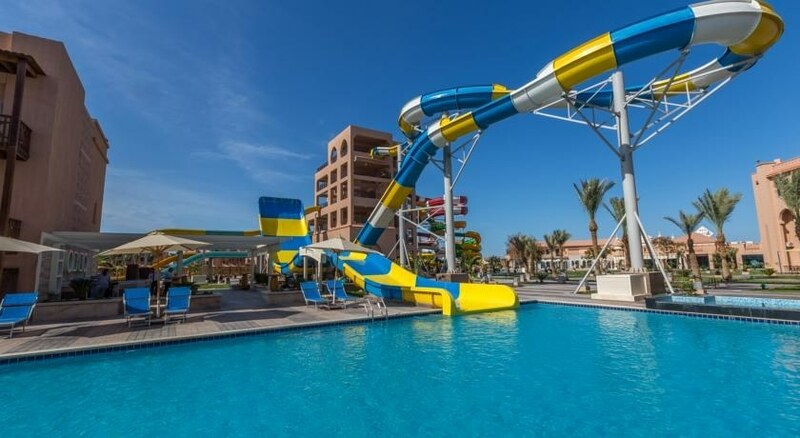 The Albatros Aqua Park Resort is located in the city of Hurghada and only five minutes’ walk from the beach, where you can play volleyball, sunbathe or indulge in underwater diving. Close to the resort is a world class aquarium, a shopping centre and the famous Sand City with its impressive sculptures. 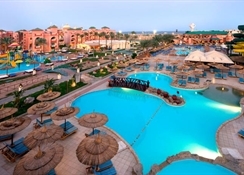 The Hurghada International Airport is 12km from the property. The Albatros Aqua Park Resort features 296 rooms with a balcony overlooking the pool or the gardens. The rooms come with the necessary amenities for a comfortable and complete stay: air conditioning, television, minibar, telephone, safe and bathroom with shower and hair dryer. The rooms are categorised as standard and family rooms with a bedroom and a separate living room. 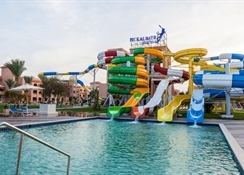 The Albatros Aqua Park Resort offers all-inclusive deals. Breakfast, lunch and dinner are each presented in buffet style. They include both Egyptian food and dishes from around the world. In addition, snacks, soft drinks and local alcohol are served at the resort's bars. 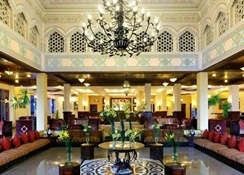 On request, guests can also use the four à la carte restaurants at an additional cost. The Albatros Aqua Park Resort has a private beach, four swimming pools with water slides and numerous facilities for the entertainment of its guests: gym, spa with steam baths, Jacuzzi and massage service, tennis and volleyball courts and a multipurpose court. It also has a kid’s club, a business centre, a hairdresser, a souvenir and shops. Guests can play mini golf or table tennis and enjoy live shows in the evenings. The resort offers several services, such as car and bicycle rental, laundry, dry cleaning and ironing, babysitting, prepared meals, fax and photocopying. The 24-hour reception offers tour assistance and luggage storage. There is Wi-Fi in the common areas. Overall hotel was well very nice. It was clean. Well presented. My only complaint is that one of the staff. Wasn't very nice when we asked for Irish coffee. Seemed to have a really bad attitude.